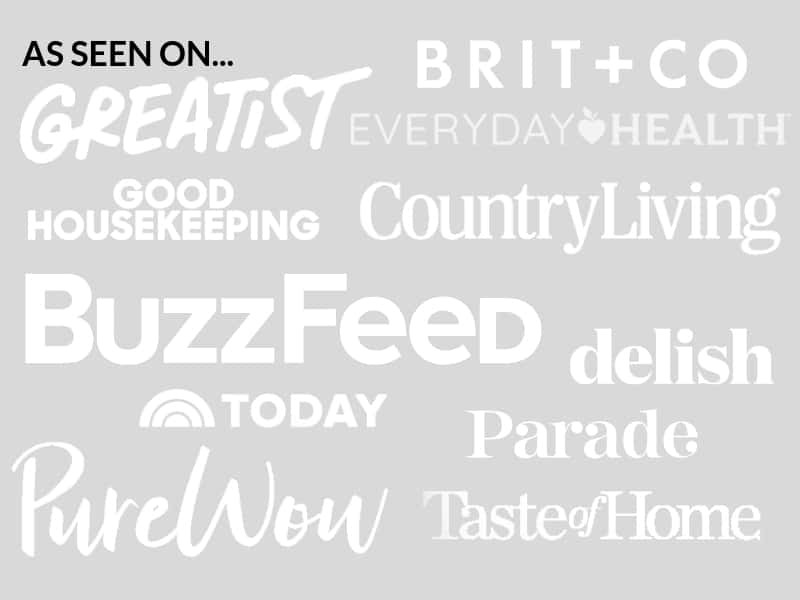 April 26, 2017 By Elizabeth Lindemann 2 Comments / This post may contain affiliate links. 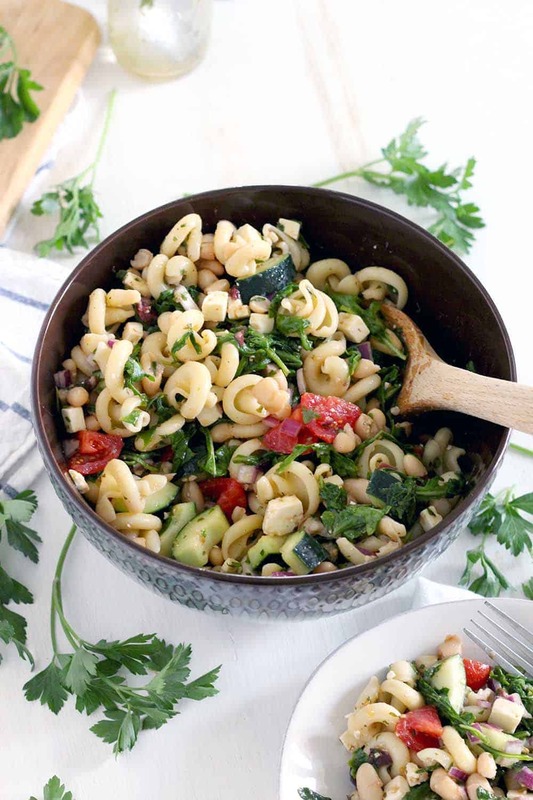 This Greek Pasta Salad with Herb Vinaigrette is the PERFECT healthy Mediterranean meal or side dish. It uses only half the amount of pasta than usual since it’s packed full of other nutritious ingredients- like white beans, tons of baby arugula, and fresh veggies. It makes a super refreshing vegetarian meal or side during warm weather, and would be great for a potluck or picnic since it can be made in advance. Nothing says “Greek Salad” more than cucumbers, tomatoes, feta cheese, olives, and red onions. And all of those bad boys are in here, along with two cups of wilted baby arugula, white beans, and pasta, all of which absorb the flavors in the herb vinaigrette. We need to talk about this for a minute. It’s made from fresh mint, fresh oregano, and fresh parsley, combined with red wine vinegar, extra virgin olive oil, a touch of honey, salt, and pepper. It’s easy to shake together quickly in a mason jar and use on this- and other- salad recipes. The honey cuts down on some of the acidity of the vinegar, which I always find a little bit too jarring in Greek salads. Don’t worry- if you don’t have fresh herbs you can easily substitute them with dry. As with any pasta salad, it’s important that the pasta be cool when you mix everything together since if it’s too hot, it will absorb too much of the dressing and everything will dry out too much. This can be a bit tricky, as pasta tends to stick together while it cools. To prevent this, toss the hot drained pasta with 2 tablespoons of the dressing. And while you’re there, toss the arugula in with the pasta- the heat from it will wilt the arugula down, so you don’t have to worry about steaming it separately. My favorite thing about this recipe is that you can make it ahead of time. In fact, the flavors marry together the longer it sits, so making it a day or two in advance might be well worth your while. And it makes GREAT leftovers. Plus, it’s inexpensive to make, especially if you are growing fresh herbs yourself, and takes only about 30 minutes total. 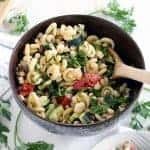 One word of caution: it’s important that the ingredients are as dry as possible before mixing together, so the pasta salad doesn’t get watered down as it sits. The tomatoes can be particularly watery, so I chopped them, set them in a mesh sieve over a bowl, and sprinkled them with salt to draw the liquid out. I let them sit there while I prepped everything else, then patted them dry with a paper towel. I also scooped the seeds out of the cucumbers, which is where most of the water is stored. If you like this Greek Pasta Salad with Herb Vinaigrette, you’ll love this Mediterranean Chickpea and Orzo Salad, this 20-Minute Creamy Lemony Vegetable Pasta Salad, and this Tzatziki Greek Yogurt Chicken Salad. 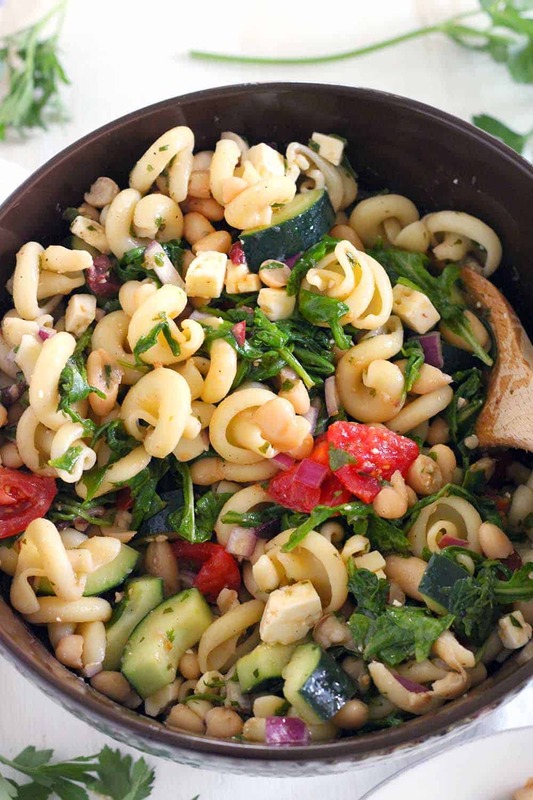 This refreshing Greek Pasta Salad with Herb Vinaigrette recipe is packed with healthy ingredients like white beans, arugula, and fresh veggies. The perfect Mediterranean vegetarian meal or side! Add all ingredients for dressing to a mason jar or bowl and shake or whisk thoroughly, Set aside. Place chopped tomatoes in a mesh sieve and set sieve over a small bowl. Sprinkle with a pinch of salt and set aside for the liquid to drain from the tomatoes. Meanwhile, cook pasta according to directions until al dente. Drain the pasta and return to the pot. Mix with 2 tablespoons of the dressing. Add arugula to the hot pasta and stir. Cover and allow arugula to wilt (about 5 minutes). Uncover and allow pasta to cool for another 5 minutes or so. Meanwhile, pat tomatoes with a paper towel to remove even more liquid from them. 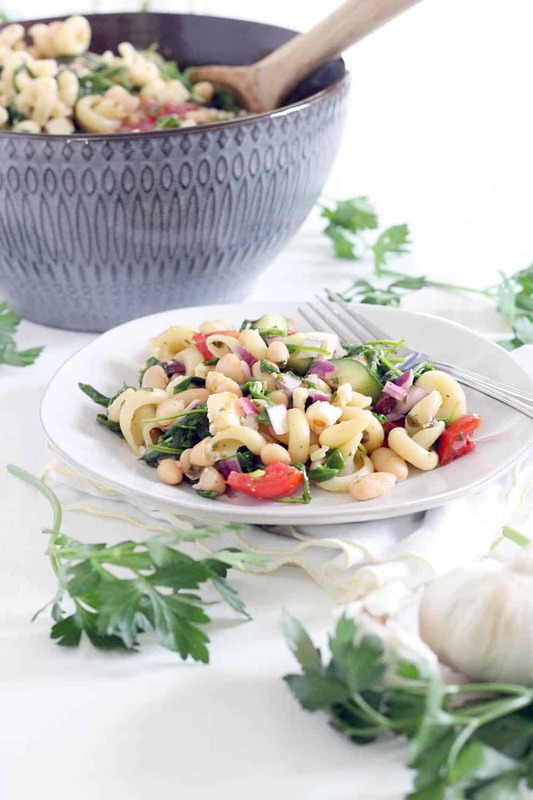 Mix together cooled pasta and arugula mixture, beans, tomatoes, cucumber, onion, olives, and feta cheese with remaining vinaigrette in a large bowl. Season to taste with salt and pepper. Serve. Hello can you please tell me how many calories are in this dish. Hi! Thank you for your patience with my delayed response. I’m in the (very slow) process of updating all my recipes to have nutrition information, so I went ahead and updated this one! Looks like it’s about 536 calories (if you go by 4 servings for the whole thing). See the recipe card for other estimated nutrition information. Hope that helps!